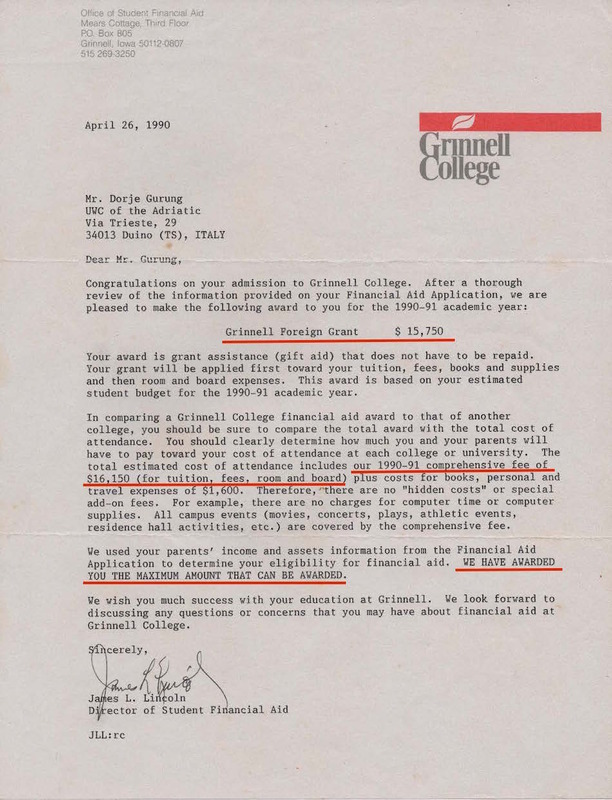 One of the happiest days of my life was the day I opened the following letter from Grinnell College. The letter signified the fulfillment of a long-held dream I had as a fifth grader, though at the time it had appeared to be a near-impossible one! Some say that luck favors those who work hard. Still others say that you make/create your own luck. Who is to say what my case was! But as life-changing as the event of that day was, and as much as I had been working towards it, receiving that letter too involved some degree of luck, just as a number of other significant events in my life have. Getting to attend St. Xavier’s Godavari and getting a scholarship to UWC of Adriatic are two that come to mind. A number of schools accepted the Common Application form. When I completed it and was ready to file my applications, I simply made Xerox copies of the Application. But just to be on the safe side, in case I needed to replace a bad copy of a page or two, I made an extra copy. Sending the applications off, I was left with one perfectly good set! Going through the list of schools I had decided not to apply, I came across Grinnell! For whatever reason, I had struck it out. Thinking that throwing the application pack away would be a waste, just on a whim, I sent it to Grinnell! By the time the financial aid offer arrived, I had had a number of offers. None as good though. One had provided a full tuition waiver and was trying to work out room and board. When I received Grinnell’s offer, I didn’t think twice, of course! Not much long after receiving that letter, I must have gone out for a meal or two with my girlfriend and other close friends I am sure. But I vividly remember one celebratory meal: pizza at the Bowling with my Polish friend. And pizza at Bowling had been it. In the email, she had said she had received a few offers, two of which were full scholarships, including flight! How incredibly surreal it may have seemed to her at times that she was now poised to head to yet another country for tertiary education, just as it had been for me over twenty years ago! I also wondered how she must have celebrated! What’s also been very heart-warming is how incredibly encouraged and inspired children from her community must feel knowing that someone from their community has gotten so far in her academic life…so unimaginably far. I am sure, when I also flew off to Italy and then the US, members of my own community must have felt the same! My hope is that I am able to continue to help others like Iju to experience the kind of day I had that Spring in 1990. I hope I am able to continue providing the kind of day Iju must have had this past Spring. And I also hope that those lucky enough to get such opportunities continue to inspire others in their communities, just as I would like to believe Iju and I did and continue to do!